In most legal codes there is no concept of a legal vacuum, since lawyers, judges and experts on jurisprudence everywhere believe that for every act some law or other must apply. In English and American law, for example, it is inconceivable – to lawyers, judges, politicians and policemen – that the law ceases to have application. It is possible, they admit, that there are situations which are so novel in fact, or so unprecedented, the statutes, regulations, and decided case law haven’t caught up with the realities. But catch up the legislators and judges do. These aren’t vacuums, so much as gaps which are invariably plugged. What happens if a government or a legislature, acting beyond its authority, gets a court to rule in violation of its constitution? That isn’t a vacuum. It is double-barrelled unlawfulness or illegality. But since the fingers on the trigger didn’t have the authority to pull, the outcome is what the lawyers call a legal nullity. It doesn’t require challenge or appeal. It is void from the start. For examples in international law of what the doctrine of nullity means, read on. For an interpretation of a legal vacuum by the Russian Constitutional Court, click here. On Friday, March 14, the Ukrainian Constitutional Court issued what it claims to be its decision on the application by Ukraine’s acting president, Alexander Turchynov (image, right), and the parliament, Verkhovna Rada, to judge whether the Crimean referendum was within the powers of the Crimean government and parliament to hold, and of Crimean voters to decide. The court convened its hearing on Friday morning. In the early evening, the court issued a press release claiming a hearing had commenced. Later the same evening, a 10-page text of the court’s decision was issued. Written by two of the fifteen judges who are reported to have participated, the published text was in the Ukrainian language. The court has yet to publish a Russian-language version; it stopped publishing in Russian on March 6. Here is a rough, unofficial translation into English of the Constitutional Court’s document. On Sunday, the referendum was implemented in Crimea. The official ballot count indicated that 81.3% of eligible voters participated. Of these, 96.8% voted in favour of acquiring the rights of a subject of the Russian Federation; 2.5% for preserving Ukrainian sovereignty under the 1992 Ukrainian Constitution. By legal vacuum, Churkin meant there had been a breakdown of constitutional authority in Kiev from February 21. This was also the position of the Crimean Council of Ministers towards declarations of acting president Turchynov preceding last Friday’s Constitutional Court session. In short, Turchynov’s declarations were nullities. Much hangs, and a good many nullities, on what exactly happened at the Constitutional Court in the days and hours before the Friday document was issued. The spokesman for the court, Gennady Chernenko, acknowledges it was impossible under the quorum rules of the court for there to be any hearing or decision on Turchynov’s claim until Friday. 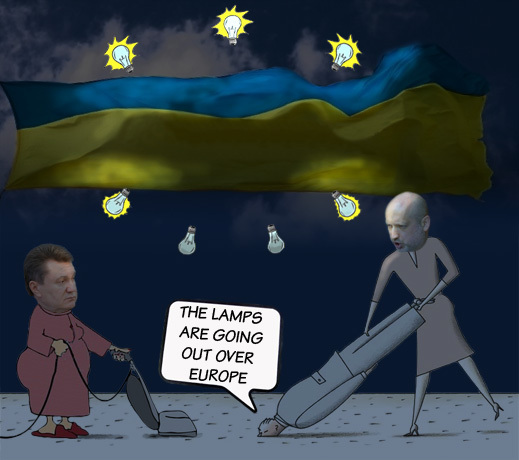 That problem, the court spokesman also admitted, began on February 24, shortly after Turchynov assumed presidential powers, appointed Yatseniuk prime minister with a cabinet of others voted by the Verkhovna Rada, and together agreed to the dismissal of five Constitutional Court judges. The five dismissed immediately by a vote of the Verkhovna Rada were the court’s chairman Vyacheslav Ovcharenko (right), and four others – Anatoly Holovin, Mykhailo Kolosa, Maria Markush, and Oleksandr Paseniuk. At Title XII, the Ukrainian Constitution sets out the requirements for the Constitutional Court. The number of judges is fixed at 18 comprising three quotas. Six must be appointed by the President; six by the Verkhovna Rada; and six by the legal profession acting through the Ukrainian Congress of Judges. One of the presidential appointees retired last autumn, and President Victor Yanukovich (lead image, left) hadn’t replaced him by the time he was ousted on February 21. Once parliament sacked the five, the remaining bench comprised just 12. It was also proposed by the deputies that Turchynov should dismiss two judges from the presidential quota – Deputy Chairman Yury Baulin, who had been appointed in 2008 by President Victor Yushchenko; and Judge Sergei Vdovychenko, another appointee of Yushchenko’s in 2008. 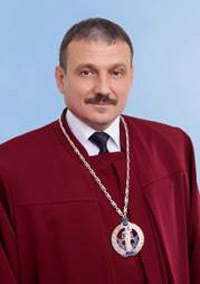 At the same time, the Verkhovna Rada sent a request to the Congress of Judges to convene within three days and vote to dismiss five of its appointed quota – Vasyl Bryntsev (below 1), Mykhailo Hultai (2), Natalia Shaptala (3), Oleg Serheichuk (4), and Mykhailo Zaporzhets. Their court biographies can be read here. With the exception of Bryntsev who was appointed in 2005 (Yushchenko) , the other judges were all named by the judicial congress held in September 2010, when Yanukovich was seven months into his presidency. The newly appointed General Prosecutor was ordered by the Verkhovna Rada to open criminal investigations against all the names on the proscription list for the court. The Congress of Judges refused to meet under these conditions. Instead it decided to postpone a new congress until April 7. For the time being, Bryntsev and his four colleagues are hanging on to their seats. The Ukrainian Constitution protects the Constitutional Court judges by granting them a single, non-renewable term of 9 years, with “guarantees of independence and immunity”. Art. 126 provides “the independence and immunity of judges shall be guaranteed by the Constitution and laws of Ukraine. Any influence on judges shall be prohibited.” The order to start criminal proceedings against the judges, issued by the Verkhovna Rada on February 24, appears to have been a violation of Art. 126. This didn’t matter to Turchynov and Yatseniuk in Kiev on February 24. It did matter to them on March 6, after the Crimean referendum was announced in Simferopol. As the Crimeans pointed out to Turchynov, without a ruling from the Constitutional Court, the referendum was as constitutional as Title X and Art. 138 said it was. Turchynov now needed Baulin and Vdovychenko to remain on the bench, so long as they could be induced to vote against the referendum. As Cherynenko now admits, several judges kept away from the court so that there could be no quorum, and no ruling on the Crimean question. On March 12, just four days before the referendum was scheduled, the Verkhovna Rada attempted to appoint five new judges. This required a bare majority of 226 votes of the chamber. One of the five fell short; four passed — Serhii Sas (below 1), Stanyslav Shevchuk (2), Mykola Melnyk (3), and Ihor Slydenko (4). They took their judicial oath on March 13. So rapidly were they put on the bench, the court website was able to include the names in its Ukrainian list, but without their biographies. When last Friday dawned, there were 16 judges, according to the Ukrainian version of the court website; 13, according to the Russian; and just 12, according to the English. Among the refusenik judges, just one, Alexander Kasminin (right) was absent from the Friday session called to hear the Crimean referendum case. Kasminin was born in Poltava, in eastern Ukraine, between Kharkov and Dniepropetrovsk. Before his appointment to the Constitutional Court in 2013 he had spent most of his legal career in his home town. When the quorum was assembled last Friday, Baulin presided. The court announcement reveals that just two presentations were made – by Judges Peter Stetsiuk and Alexander Tupytskyi. Stetsiuk is from the western Ukraine and spent most of his career in Lviv. 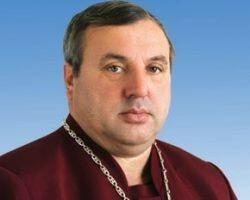 Tupystkyi was born in the west, and served in courts in cities of both west and east. After they made their presentations, the judges adjourned to make their decision in camera. Recorded officially as represented in the courtroom were members of the Kiev government, the Verkhovna Rada, and the press. There was no presentation by lawyers or representatives of Crimea. The court document summarizes the claims of the two applicants, the acting president and the Verkkovna Rada. Since the Crimea was unrepresented in the proceeding, there is no reference to its arguments for the constitutionality of the referendum; its contention that the acting president lacked legal standing to apply to the court; and its case that the proceedings against the court judges amounted to unlawful intimidation prior to the Friday’s hearing. No case law, neither domestic nor international, is cited in support of the conclusions. The reference to what “States Parties shall refrain from [doing]” isn’t what a judge, or 15 of them, would have composed in this context. It appears to have been dictated at the Russian Government by someone in Kiev who wasn’t a party to the referendum proceeding.